Sometimes a guy just can’t catch a break: ask three ruffians who had little to show after today’s “reign of terror” except black eyes and bruises. Stealing a flivver was the easy part. The trouble began when they tried to hold up a disabled man, William Gehem, at the intersection of Sunset Boulevard and Benton Way. Unimpressed by the large revolvers aimed at his person, Gehem smacked one of them out of his assailant’s hand with his crutch. In retaliation, the bandits knocked him down and robbed him of $12. The trio next drew their guns on one Sol Feyer. Accosted on the Cornwall Street bridge in Hollenbeck Heights, the feisty Feyer grabbed one of the guns and threw it in the gutter. He then acquitted himself with his fists so well that the bandits jumped into their car and sped off—but not before Feyer, lying bruised in the street, reached up and removed their license plate. Things went a little better at Rosemont Avenue and Larchmont Boulevard, where the hoodlums held up John Lentz without incident, making off with $100 in cash and jewelry. But such luck couldn’t hold. Their next “victim,” Walter Swanson (attacked while walking at Pasadena Avenue and Avenue 63), beat two members of the gang with such gusto that police believe they were forced to abandon their nefarious activities for the night. Swanson estimated he battled with the beasts for ten minutes before losing consciousness and being dragged into a vacant lot, where he was stripped of $7 in cash and a $60 watch. Acting on a telephone tip, police arrested the 19-year-old driver of the stolen getaway car at Pasadena Avenue and Piedmont Street. One can only assume he was relieved to see them. “What’s a father to do?” lamented Dr. Eric R. Wilson today, after his 17-year-old daughter, Dorothy, accused him of beating her and taking her money before throwing her out of the house. Police officers escorted the girl to Juvenile Hall after they discovered her, hysterical, outside the family home at 176 North Mansfield Avenue, Hollywood. Their first stop, however, was at Receiving Hospital, where Dorothy was treated for a broken nose, injuries to her eyes, and bruises to her lips and body. Wilson admitted he “slapped” Dorothy after he and his wife returned from the theater last night and observed shadowy figures slipping out the side entrance as they entered the front door. Dorothy denied she had gentlemen callers while her parents were out. “She lied to me, and I make no apology for it,” said Wilson. “I slapped her down. She hit the side of the davenport and rolled on the floor, and then she pulled the hysterical stuff.” He denied taking Dorothy’s money or ordering her to leave home. Officials at Juvenile Hall confirmed that Dorothy Wilson was incommunicado pending an interview with a policewoman. Motion-picture actor J. Wallace Walker, of 1636 Argyle, had lost his fiancé (and also-actress [as Jane Terry]) Polly Wheaton to another gent, one James Lewis. Miss Wheaton and Mr. Lewis were having coffee in Lewis’ apartment at 525 Santa Barbara Avenue when Walker burst in brandishing a butcher knife. Walker forced Wheaton into his car and beat her as he drove, until she leapt out at Beverly and Western. Walker jumped out after and continued to beat her on the sidewalk until a friendly taxicab driver stopped him and took her to her apartment. Walker continued on with his illustrious career, while Miss Wheaton is not to be found among cinematic legacy. One Scott Stone, a night watchman in the Glen Airy district where Mrs. Buus and the girls lived, was meanwhile arrested on a charge of contributing to the delinquency of a minor. 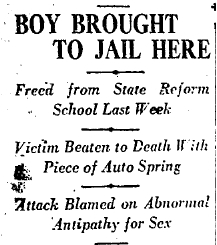 Circumstantial evidence linked him to the Martin slayings and on October 1, 1925 he was indicted for murder. It seemed that Mrs. Buus’ prayers had been answered. Today Mrs. Buus wrote a belated but nice letter to Stone, saying she was happy his sentence had been so commuted. Where her heart went from there we do not know. Today, fencing master and underwear salesman Lt. Gerard De Mereux was vindicated for the second time in the space of a week. Last week, De Mereux was awarded $500 in damages in a suit against Hollywood director J. Stuart Blackton, who was accused of beating De Mereux with a horsewhip. De Mereux had been living as a guest in Blackton’s home, giving fencing and corrective gymnastics lessons to Blackton’s daughters. De Mereux testified that Mrs. Blackton had given him a romantic note, and that as a gentleman, "the only honorable thing for him to do was leave." While packing his bags, Mrs. Blackton reportedly began to strike and spit at him, at which point, Blackton entered the room with a riding crop and beat De Mereux about the shoulders and chest. Blackton testified that the attack was prompted by De Mereux’s attack on his wife, during which he choked her and clawed at her with his fingernails, drawing blood. But ho! De Mereux presented to the jury his fingernails, and brought forth numerous witnesses who claimed that De Mereux had spent the past 12 years as a confirmed nailbiter who could not possibly have scratched a soul. Following the judgment, De Mereux was taken before the Lunacy Commission on an insanity complaint offered by Albert A. Kidder, Blackton’s attorney. 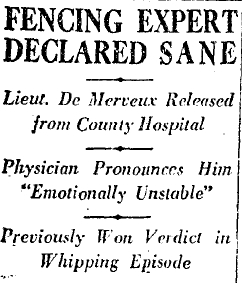 After several days of observation, physicians from the Lunacy Commission declared him merely "emotionally unstable," but were unable to find evidence of the insanity complaint, which, among other things claimed that De Mereux had threatened Blackton’s daughters. 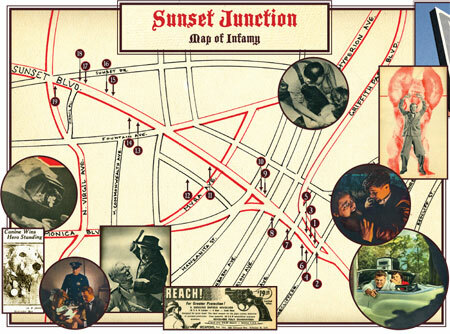 Update: since editor Martin Albornoz chose never to pay me for the Sunset Junction crime map that ran in the L.A. Alternative, yet continues to run ads for L.A.’s dopest attorney, hot roomates and male dating services alongside the digital version, I’m going to host my own archival copy right here at 1947project. The art is by Heidi Fikstad from images from my personal collection. The strange and unusual multitude of murders, suicides, robberies, car crashes, ukelele beatings, firefighting pups and other odd factual tidbits from the historic era of today’s Sunset Junction. Los Angeles is older than she looks-225-and her memory banks are piled high with forgotten oddities that were once big news. 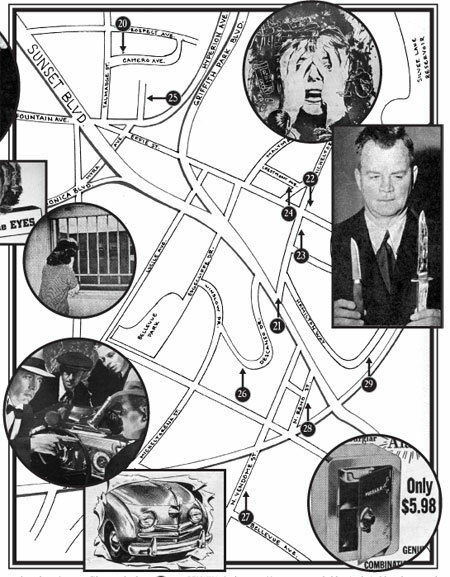 To celebrate the Sunset Junction street fair, we wanted to revive some of those memories via a crime geek’s digging through the historic L.A. Times. Just like your grandpa might remember when those fools blew their gun shop up every time he tools past in his flivver, you might raise a mental toast to Jac Zinder when driving Sunset Boulevard around November. These memory maps are the soul of our city; we lose so much when they fade. Here is a smattering of historic oddities, to make it a richer neighborhood for whippersnappers of all ages. May all the dead ones rest in peace. 2. Sunset at Edgecliffe: Thanksgiving night, 1994- Fuzzyland club promoter, DJ and musician Jac Zinder, passenger in a car traveling on Sunset, is killed in a head-on collision with a drunk driver who crossed into oncoming traffic while driving without headlights. 3. 3719 Sunset: December 1968- A flower power pigeon has made itself at home in a flower shop. It spends much of each day flying with friends, then zooms in the back door between 3:00 and 3:30 p.m. to nap. The proprietors leave birdseed in a bowl in its favorite niche, and have to duck when opening the door in the morning because the beast is so anxious to soar. 6. 3728 Sunset: February 8, 1959- Traveling east on Sunset, Arthur R. Forsyth, 23, clips a light pole and loses control of his car, which crashes into the front of the liquor store here. Forsyth is killed. 7. 3814 Sunset: This was the home of Kentucky Boy III, the brave and clever Airedale doggy who, in 1929, famously snapped his lead and raced two blocks down Hollywood Boulevard towards a burning movie studio. His master Robert Milton Byrne summoned fire engines and an adjacent theater, packed with patrons, was saved. In 1932 a juvenile cowboy orchestra serenaded the pup on the steps of City Hall as he was presented with one of 19 medals he would receive. Kentucky Boy died, aged 15, in September 1937, leaving his master unprotected. On June 23, 1939, the 65-year-old Byrne was found dead in his bungalow, victim of a brutal hammer attack. Evidence suggested the man might have lingered in a confused and bloodied state for as long as two days before dying, just 10 feet from the phone. Concerned neighbors peeked in a window, saw blood, then called police. A table was set as if for breakfast for two, and in the sink a carpenter’s hammer had been wiped of fingerprints. Byrne had seven skull fractures, a serious eye injury, and was covered in abrasions possibly caused by multiple falls. Some partial fingerprints were found in the house, and sent to the FBI in hopes of finding a match. Neighbors reported Byrne often entertained strange young men, so the pool of suspects seemed limitless, but police expressed particular interest in speaking to the 6-foot, 200 pound man seen with Byrne on the evening of June 19. In late July, police picked up and released Emacora F. Foschia, 30, on suspicion of Byrne’s murder, and the following January they questioned taxi driver Knud Troelsen, 46, who was picked up for a robbery and discovered to have a collection of female clothing in his home. Troelsen protested that he was being persecuted for his labor activities. The slaying appears to have gone unsolved. 10. 4017 Sunset: May 9, 1936- Despondent over ill health, taxidermist Joseph Colburn, 60, shot himself in his brother’s shop, surrounded by hundreds of beady eyes of the creatures he had stuffed. 12. 4240 1/2 Gateway Avenue: November 17, 1927- When the cops busted in looking for Harold Thatcher, a suspect in September’s sensational $73,000 payroll robbery at the Bureau of Power and Light, they discovered his wife Mabel, 19, near death in a gas-filled room. Harold was found sleeping elsewhere in the house. Rushed to the hospital, Mabel admitted attempting suicide due to illness. The irony of her life being saved as her husband was arrested was not lost on officers or the Thatchers. 13. 4384 Sunset: January 30, 1942- Spiritual seekers can no longer visit the little shop on the Boulevard to satisfy all the questings of their souls, since Charlotte Jean Le Nord, 25-year-old crystal gazer, fired a bullet through the breast of her “adopted” mother, palmist Mme. Lorraine (née Celeste Frank), 50. The older woman fell dead on the floor of the combined kitchen/dressing room in back of the white frame structure, the scent of incense mingling with the coppery stench of warm blood, beside a dresser topped with a shrine to the ashes of the dead woman’s husband. Her killer placed a pillow under the victim’s head, then drove to the police station to confess. Charlotte explained that the pair had met in a Michigan department store several years ago. Mme. Lorraine told Charlotte she looked just like her dead son, and asked her to come live with her and her husband. They traveled the country performing a spiritualist act as a trio. When Mr. Frank died last September, Charlotte stayed on, telling fortunes on Sunset while Mme. Lorraine read palms in a downtown shop. Charlotte said she’d been drinking all day to appease a cold, and had parked her car on Sunset instead of in its space behind the building. Mme. Lorraine upbraided her for this, and Charlotte pulled out the .32 caliber revolver she’d previously hidden from the older woman, citing fears that the bereaved widow might kill herself. And then, the unthinkable. Charged with murder, Charlotte panicked when she learned her trial would be held on the seventh floor-Mme Lorraine’s unlucky number, and the hour of her death. She sobbed uncontrollably on the witness stand, describing how she had “playfully” pointed the gun at her beloved benefactress and said, “Bang!” after the older woman snapped, “I could wring your neck!” The gun went off, despite Charlotte having, she swore, removed all but two bullets at the bottom of the chamber. She strongly denied police conjecture that they were playing Russian roulette in emulation of a film or that they had a suicide pact. A munitions expert testified that the weapon was defective, allowing the cylinder to spin without the trigger being pulled. The jury of nine men and three women accepted Charlotte’s profession that the death was accidental, and acquitted her after an hour’s deliberations, calling it “a tragic but unavoidable accident.” Because folks just pointed guns at each other and said, “Bang!” all the time in 1942, but that didn’t mean any harm was intended. 14. 4400 Sunset: April 12, 1952- A spectacular fire gutted the Akron Army & Navy Store warehouse this afternoon, causing $100,000 in damages and sending Fire Captain Earl McKee to the hospital after he fell through the roof and fractured an elbow. Several thousand spectators watched as sixty firemen from ten companies failed to stop the enormous blaze, but kept it from spreading to an apartment house on Virgil Avenue or the ladder shop next door. Curiously, business continued as normal in the surplus store, while the overstock burned down the block. 15. 4415 Sunset: January 4, 1920- Celebrated inventor Dr. Harry Barrington Cox (”the father of the dry cell battery”) called journalists to his laboratory and announced today a revolutionary advance that will preserve fruits and vegetables indefinitely, without the use of ice or chemicals. Cox has found a way to harness the power of the Earth, the same energies that keep food fresh on the vine or branch, even after they’ve been harvested. He proved it by displaying perfectly fresh oranges, peas and other fruits which he swore had been picked more than a year before. This discovery, the product of two years of research, Cox offers to California and the world as a New Years gift. More research is necessary to confirm the findings, but Cox says as long as the food is placed in an ordinary can, with metal wires creating a circuit to earth or water, and a little bit of the good doctor’s top-secret “vitalizer” at the bottom, extended preservation is a certainty, and the world will be immeasurably improved. 16. 4419 Sunset: January 21, 1929- When officers of the LAPD gun squad raided this home they discovered $1,500 in illegal whiskey, plus evidence of a complicated bunko scam. Arrested were Joe Besso, 42, and Gino Cesare, 57. Also seized from Cesare was a wallet containing several hundred dollars in real money and significantly more in counterfeit bills and rolls of newspaper of the type swindlers use to stuff poor boxes in immigrant communities. Victims of recent poor box scams are being urged to visit Central Police Station to see if either yegg looks familiar. 17. 4443 Sunset: November 11, 1947- Somebody has it in for radio shop owner Ted Wells, who got little work done today while dealing with the fallout of this weisenheimer’s idea of fun. First there was the $1,000 TV set supposedly ordered by a downtown bar. Ted lugged the bulky machine up the tavern steps, only to discover no one had called. Back at the store, taxis arrived on the hour, seeking phantom fares. The Fire Department showed up looking for a fire, followed by seven LAPD cars responding to a call of a stabbing. Phoned by a reporter, Wells expressed befuddlement as to the identity of his tormentor, then excused himself to answer the door. 18. 4473 Sunset: April 18, 1971- Christopher Russell, a 29-year-old transient, emerged from the all-night adult cinema where a robbery alarm had just been pulled, and took a revolver from his back pocket. When he ignored police orders to halt, Officer R. L. Bassett shot him twice in the chest. He was taken to County USC in critical condition; the gun was a plastic toy. 19. 4480 Sunset: August 17, 1924- This is the home of Harry Lowe, who, while picnicking with his family near Mint Canyon, discovered a suspicious burial site and alerted the Sheriff on his return to civilization. Deputies returned to the remote site, where they disinterred the remains of a monkey. 20. 4413 Camero: December 19, 1922- Although it means giving up a $250,000 legacy dependent on her marrying within her Protestant faith, Mrs. Olga Crane Lynch, 18, today escaped from her father’s home where she had been held captive since confessing her September 1st elopement with Catholic T.J. Lynch. She smuggled a note out to her husband who asked the district attorney to intervene. Called to City Hall, Olga’s father claimed his daughter had gone to San Francisco for six months “to see if she really loves him. I understood that Lynch had acquiesced in this arrangement.” Moments later, the girl was brought in by Detective George Contreras, and raced into her husband’s arms. “I am of age, I love my husband, and I am going to live with him!” she declared. Her father told her to go to blazes, and he and his wife stomped out. The young Lynches plan to go to New York. 22. Micheltorena & Effie Street: September 5, 1926- Piloting a stock Packard 8, Frank Randall set a record on the Micheltorena grade of 58mph, having turned off Sunset at a full clip. He was then “pulled over” by LAPD motorcycle speed squad officers Snider and Goldy, who gave Randall a souvenir speeding ticket to commemorate the planned record attempt. Six years later, the makers of the Essex Terraplane used the same grade to prove the hill-climbing power of their vehicle, reaching a top speed of 39.5 mph from a standing start, in high gear, with two passengers. 23. 1600 block of Micheltorena: January 27, 1922- Four days after he was found gravely wounded on the ground on the Micheltorena hill, doctors removed one of two slugs from his brain and motion picture cameraman Paul Cramer was able to tell detectives that his mother-in-law Mrs. Mattie Hannon had shot him. It seemed Mrs. Hannon was upset that Cramer and her daughter had moved from her house at 1504 Golden Gate Ave. into their own home. The woman accosted Cramer outside the new place at 1135 North Hoover and solicited a ride. Along the way she pretended to have lost her keys, and while Cramer was looking for them, she unloaded a .32 into his head; four bullets penetrated, two entering the brain, and Cramer knew no more. After the bed-ridden Cramer made his statement, Mrs. Hannon was taken into custody and informed that she would be charged with murder should he die. Winifred Cramer (known on screen as Jean Marlow) declared she would not visit her mother until her husband recovered, which doctors said he would. Mattie Hannon was found guilty of attempted murder and served a year’s sentence. Fifteen months after the shooting, Winifred divorced Paul, charging cruelty. The marriage left him two lifelong keepsakes: a deafened ear and a bullet in the jaw. 24. 3516 Crestmont: January 21, 1937- Dr. Albert F. Zimmerman, ear, nose and throat specialist, enjoyed one final midday meal with his wife before descending into his basement bathroom where, gazing into the mirror, he fired two shots. One pierced the wall, the second his skull. The dead man had been sickly and depressed about financial problems. 25. 1406 Manzanita: April 11, 1924- “Sure, my buddies and I stole gas from William Hill’s gas tank,” admits Charles Duncan Brotemarkle, “But we had nothing to do with hitting him over the head with that claw hammer.” So is the claim of the Hollywood High ROTC sergeant, 16, discovered with a garage full of stolen automotive accessories behind his grocery store manager father’s house at 972 Hyperion. Hill’s brother Joe says otherwise, having seen Brotemarkle strike the vicious blow, and the lad is in Juvenile custody on suspicion of assault with a deadly weapon. 26. 3318 Descanso: October 2, 1945- Memo to treasure hunters: when pitching the notion of joining an expedition to locate $10,000,000 in Mexican treasure hidden by Pancho Villa, be sure the lady you met on a streetcar and asked to become your secretary/companion is not already employed by the LAPD Bunco Squad. Such was the misstep of Arthur Stuchal of this address, popped on suspicion of swindling. 27. Vendome Street between Bellevue and Silverlake: March 17, 1928- Mary E. Spangler had a cement block dam constructed behind her home on Vendome Street for use as a bridge. As the waters of the local stream began to spread, panicked neighbors sought legal redress, and all were called before Municipal Judge Bush. A visit to the scene and testimony from a city engineering inspector were sufficient to produce a verdict of guilty, and the lady was fined $25 and ordered to undo her beaver-work before the rainy season. She promptly appealed. 28. 4118 N Reno: March 10, 1926- Jesus Fernandez, formerly of this address, got one last moment in the sun today when his casket was unearthed from its plot in Calvary Cemetery and its lid cracked, all to appease the mania of his sister Mrs. Mary Burke. Ever since the 16-year-old meningitis victim’s body was hustled into the General Hospital morgue, Mary has been insisting that his body had been snatched for purposes of dissection. She claimed the family was refused an opportunity to view Jesus, and that his pallbearers had heard something rolling in the coffin. Deputy D.A. Fitts arranged for the exhumation, which revealed a perfectly ordinary burial. Mrs. Burke was apparently still upset that her father and another brother had been autopsied at General Hospital. 29. 1404 Westerly: February 23, 1941- E.D. Cassidy, hotel clerk, 36, phoned his sister Helen in Yuma and told her, “I’m going to die within a few minutes. I’m washed up. I’ve turned on the gas. Good-bye, sis. A lot of love.” She called her local Sheriff once the line was clear, and a police teletype message was rushed to L.A.’s City Hall. A call went out to radio cars in the vicinity, and Detective Lieutenants Parry and Brown responded within 10 minutes of Cassidy’s hanging up. They rushed the unconscious man to Georgia Street Receiving Hospital; he is expected to survive.